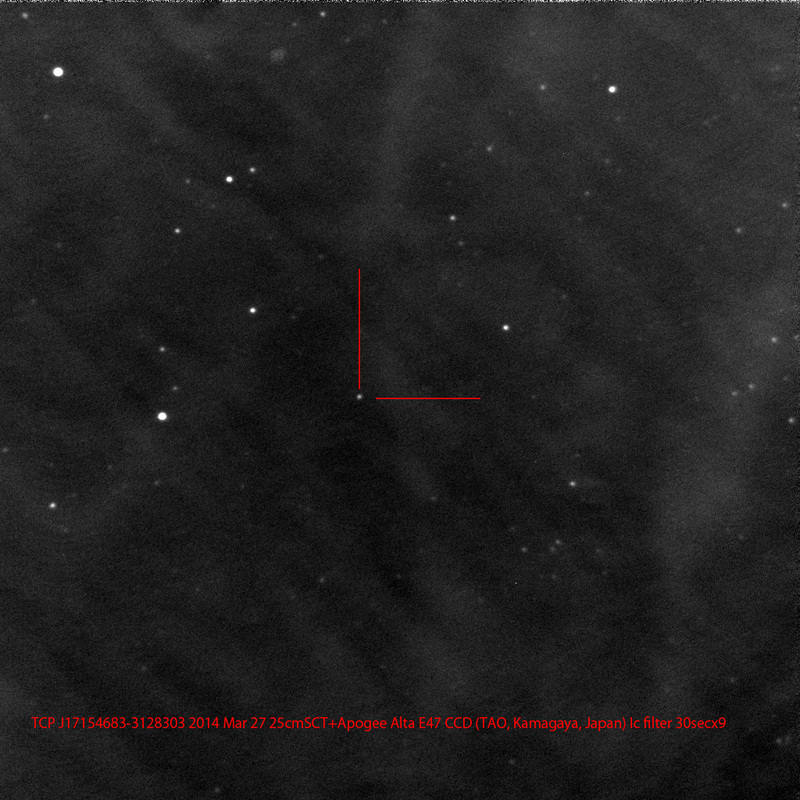 They confirmed the discovery on unfiltered CCD frames taken around 2014 Mar 26.86981 UT. Survey frames from 2014 Mar 22.819 UT (limiting mag.= 12.5) and 23.836 UT (limiting mag.= 12.9) show no object, nor does DSS or USNO-B1.0. The nearest star in the DENIS Database has position end figures 46.861s, 30.48", distance 0.44", magnitude I=14.222. ATel #6015 (E. Kuulkers et al.) reports that Swift observations taken only hours after the discovery (March 27 03:39-03:51 and 04:42-04:51 UT) reveal a new, bright, X-ray source. The source is also seen in UVOT, with uvw1 magnitudes of 12.58 +/- 0.02 and 12.61 +/- 0.02, for the 2 snapshots, respectively. The positions they derive are consistent with the optical discovery position. The mean X-ray spectrum is consistent with an (expanding) shell in a nova. The position was covered during an XMM-Newton slew on UT 2011 March 4, but no source was seen with a 0.2-12 keV 2-sigma upper limit of 0.54 c/s. Follow-up Swift ToO observations for the next days have been approved. Visual and photometric observations and spectroscopy are requested. Filtered observations are preferred if possible due to the reddened nature of the object. TCP J17154683-3128303 has been added to VSX. Finder charts with a comparison star sequence for TCP J17154683-3128303 may be created using VSP. Please report observations to the AAVSO International Database as TCP J17154683-3128303. Finder charts with a comparison star sequence for TCP J17154683-3128303 may be created using VSP. Please report observations to the AAVSO International Database as TCP J17154683-3128303.